The photo album contains pictures of: Col. Barney, Lt. Col. Hale, Maj. Dwinnell, Lt. Stiles, Capt. Wm. Reynolds, Capt. Crane, Gen. Sedgwick, A. A. Crane, Capt. Bird, Q. M. Randall, Chaplin Webster, Capt. Dan Mason, Paul (? ), Capt. Sperry, Gen'l. Brooks, Col. Stoughton, Harley Sherman, and an unnamed officer." 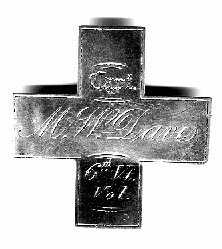 Martin Warner Davis, son of Eleazer and Dianna (Stoddard) Davis, was born 24 Jan 1836 in Newark or Coventry, Orleans County, Vt. Educated in a log school house, he later attended a select school for a short time and this was supplemented with a course at the Orleans Liberal Institute which he attended 1852-3. Between 1855 and 1859 he taught school winters and worked the farm summers. He continued farm work until the Civil War broke out. Martin Davis enlisted in Coventry, 2 Oct 1861, and mustered in as a Sergeant in Company D, Sixth Regiment Infantry. He was wounded at the battle of Lee's Mills, on Warwick Creek, near Yorktown, Virginia, 16 Apr 1862. He was taken to a hospital in the Ft. Monroe area & from there to the Marine hospital at Burlington, VT. Doctors tried several times to remove the bullet with no success so it remained in his left rear side for the rest of his life." Sources: Richards, Randolf. "History of Monroe County, Wisconsin." 1912; Root, Gail Davis. 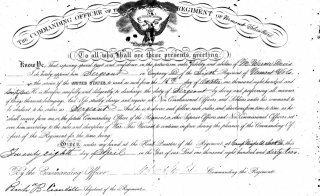 Notes from Military Service Records, Washington, D.C.